September 8, 2018 Live shows 1990-1996 5 videos were replaced with new versions that were digitized directly from the master tapes. Those shows are indicated in the notes for each show. November 3, 2017 All Modified every page on the site to limit page width to 1300 pixels, to ensure pages format properly in extra-wide browser windows. Before and After Lush Major addition: Replaced the Live Shows page (which contained clips of just a few songs) with 2 new pages that contain over 40 videos of complete shows from 1990 to the 2016 reunion, including local backups of all the videos in case the YouTube pages get taken down. Plus new pages with videos from 10 TV performances, and selected live clips. Major addition: Replaced the Promo Music Videos page with an all-new page that includes multiple screenshots for each video, YouTube links to high-quality versions of the videos, and includes local backups of all the videos in case the YouTube pages get taken down. 1989-1992, 1993-1996, 1997-Now Major addition: Expanded the Video Interviews page to include interviews from throughout Lush's career. Went from 6 videos on the old page to 30+ videos and 5+ audio interviews, with more to come. Most important, included local backups of all the interviews, in case the YouTube pages get taken down. September 6, 2017 Lyrics Major addition: Replaced the entire lyrics page with band-supplied/verified lyrics for every song recorded by Lush, obtained with permission from a limited-edition lyrics book created by a long-time fan with the full support and assistance of the band. September 5, 2017 Videos Reorganized the Video section of the site, a temporary measure until the entire section can be replaced someday. This page will no longer document the addition of individual items throughout the site, only major changes will be logged here. August 6, 2017 Press With the generous perimssion of the publisher, added the full content of the 21-page Lush special section from the print-only magazine Art Decades June 2015 issue, published a few months before they announced the 2016 reunion. July 18, 2017 Stories Added a fantastic story from Ron Wade's Vinyl Re-Spin project on Medium. He recounts going to Lush shows in Detroit back in the day and hanging out with the band. Band News, Profiles, Press, Photos With the reunion now long over, I finaly updated many sections throughout the site to incorporate information from the reunion. October 20, 2015 With the amazing news that Lush is reforming, there has been a flood of press articles, social media activity and news from the band itself which I cannot keep up with, so I'm no longer able to keep this website current. Hopefully this site will remain useful as a reference archive for the unique story of Lush, from their beginnings up to the reunion announcement - 1988 to 2015. I still hope to someday update this site with the large number of old interviews, articles, clippings, memorabilia, photos and more, kindly submitted by many fans over the years, which I have not yet added to the site. October 13, 2015 Memorabilia Added an amazing new 2015 portrait of Miki by photorealist painter Keith Klein. February 25, 2012 Memorabilia Added a beautiful new poster of Miki by illustrator Neal McCullough which Miki herself describes as "really cool." August 9, 2011 Photos Added 24 beautiful photos from three 1991 shows along with the photographer's recollections. Memorabilia Added two non-Lush tickets for1998 University of London Union shows, signed my Miki and Emma just after the official end of Lush, along with the stories behind getting the tickets signed. Note: This is the first new content on this website in almost a year. I have now accumulated over 300 Meg of photos, articles, posters, shirts, signed items, etc, all generously submitted over the last 2 or 3 years by many Lush fans, all of it still waiting to be posted here. Unfortunately I just haven't had the free time to work on the site as I used to, but I do promise to get everything added eventually, someday. Yes, even my 8 hour interview with Phil! December 19, 2010 Guestbook Switched to a new, ad-free guestbook, due to technical problems with the old guestbook. September 4, 2010 Stories Major addition: Lush - The North London Poly Years a 46 page photo book about the early days of Lush. Written by a college mate of Miki and Chris, it includes many recollections, photos from Lush's trip to their first gig outside London, Miki's handwritten lyrics and guitar tabs, postcards from the road, hand drawn flyers, and much more. May 16, 2010 Photos Added a very rare photo that includes both Phil King and Steve Rippon. April 20, 2010 Press Added a recently unearthed article from mid-1996 which has a fantastic interview with Miki about her home life, including photos of her flat and with Chris and Moose. April 12, 2010 Stories New page featuring the reminiscences and memorabilia of Guy Marshall, a fan of Lush who's been to THIRTEEN shows, including 45 photos, 4 set lists, 7 flyers & ads, 6 tickets and lots more. March 14, 2010 Photos Added 94 beautiful high-res B&W photos from the March 21, 1991 show at SUNY Performing Arts Center in Purchase NY, along with the photographer's own reminiscences from the show. December 30, 2009 Memorabilia Added the new 2010 edition of the Lush calendar by Jen G of the PVSG Yahoo Group. Its even better than last year's. November 27, 2009 Press Added interesting article from Billboard magazine about recording the Elvis Costello cover "All this Useless Beauty." 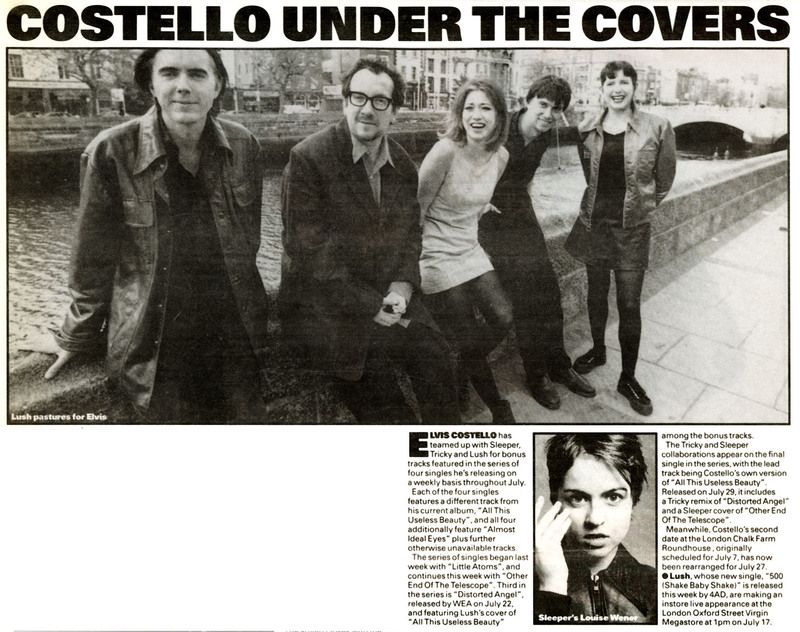 Includes some nice comments about Lush by Elvis Costello, and talks about the band's future plans. July 11, 2009 Phil's Reminiscences Added 33 of Phil's personal snapshots from the Lollapalooza '92 tour which he has generously provided to this website, along with his diary from that tour which originally appeared in the NME. June 4, 2009 Photos Added 46 screen captures from personal 'behind the scenes' video shot throughout 1992 during the Lollapalooza and Spooky tours, generously provided by Phil King. February 12, 2009 Memorabilia Added the covers and itinerary pages from 12 Lush Tour Programmes, generously provided by Phil King. They show the travel schedules for many of the band's tours. January 19. 2009 Stories Added a fun new story and photo from a fan in Italy. I have several more such stories which I hope to add in the near future. January 8, 2009 LightFromADeadStar.org Awarded Website of the Year - Fan Site by the VPME Awards 2008. January 2, 2009 Fan Art Added a brand new painting of Miki by an aspiring artist in Hawaii. November 12, 2008 Memorabilia Jen G of the PVSG Yahoo Group has designed a fantastic new Lush monthly calendar for 2009, each month featuring a different photo and caption. In PDF format. October 17, 2008 Photos Added some interesting behind-the-scenes photos from a Split photo shoot, generously provided by Phil King. October 12, 2008 Photos Added some great behind-the-scenes photos from the filming of the 500 video (US version), generously provided by Phil King. 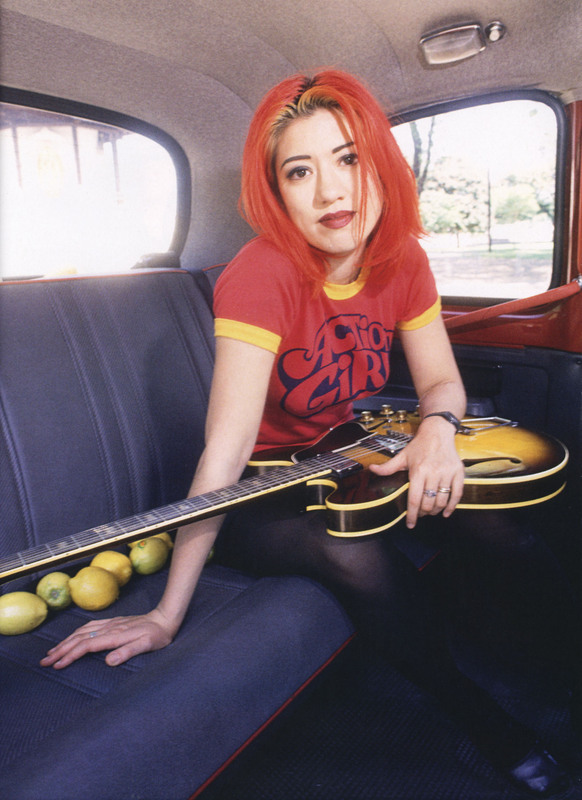 August 21, 2008 Miki's Reminiscences Miki Berenyi has kindly contributed two brand-new stories to this website, on the re-mixing of Split and the Lollapalooza tour. And Phil added some of his own photos to illustrate her story. July 29, 2008 Video Clips Added an amazing YouTube clip of Emma playing bass in the Rover Girls, her band before Lush. July 7, 2008 Memorabilia Added some signed items sent to me by Miki Berenyi, for which I am very grateful! July 2, 2008 Photos Added a group of 23 photos from the May 12, 1992 show at the Luxor in Cologne, Germany. Photos Replaced the 3 photos of the Sep. 12, 1994 show in Frankfurt with beautiful high-res versions. Photos Added 8 photos of Lush with fans in Frankfurt on Sep. 12, 1994. June 16, 2008 Gigography Finished updating the entire gigography using Miki's personal gig list which she generously provided to me, resulting in a definitive Lush gigography which should finally resolve any open questions about dates and venues. Memorabilia Added a new Laminates page containing 25 laminated passes that were generously provided by Miki and Phil. June 5, 2008 Stories I'm currently working on a large number of updates, including many corrections to the Gigography based on Miki's own personal gig list, but I want to add this new story by a friend of Chris' right away. May 27, 2008 Photos Added a group of 33 beautiful photos from the September 15, 1994 show in Hamburg. Memorabilia Added 2 new signed items to the post-Lush section. Press Added several articles about the Spur issue containing the Lilies flexi disk. May 18, 2008 Guestbook Added 2 more surveys. May 15, 2008 Photos Added 4 new photos of Lush in public and with fans and friends. May 5, 2008 Photos Added a very special group of photos from the final Lush performance, on September 18, 1996 in Tokyo, and from the day before. April 19, 2008 Photos Added a photo to the Lush with Fans section. April 6, 2008 Public Appearances Added 11 photos from a May 1996 signing in New York. Memorabilia Added 4 ticket stubs. Photos Added two beautiful photos (London, Stockholm) to the Lush Live section. April 1, 2008 Miki's Reminiscences Miki Berenyi has kindly offered to contribute her reminiscences of touring with Lush to this website. Her accounts are an essential part of Lush's history, and she will be contributing more of them in the future. Gigography Miki has also generously agreed to provided a complete listing of every gig Lush ever played, from her personal records. So far we have completed the 1988 and 1989 portions of the gigography, which previously contained many errors. March 23, 2008 Photos Added a very special photo, from the last-ever Lush performance. Photos Added 3 more photos from the 1992 San Francisco Union Square show. Memorabilia Added 16 more items, from Andy Von Pip, to the Signed Items section. March 2, 2008 Fan Art Added 11 more Desktop wallpapers by Andy Von Pip. February 25, 2008 New Section Added a Survey feature. Photos Moved a photo to the After Lush page. January 29, 2008 Gigography Made many corrections and some additions thanks to feedback from Brian M of RiSH Records, thank you Brian! Postcards Added the inside and back of the holiday postcard from the 1993 Fan Club mailing. Other pages throughout the site The response to this site has been overwhelming, thank you everyone for your kind words. Already made numerous minor/typographical corrections throughout the site thanks to your feedback. Re-organized the beautiful live photos on this page and added proper attribution -- thank you Jo Brooks for allowing me to include them on this site. Added 2 more websites to the Links page. Expand the Discography beyond the official releases. Save the photos in all the print articles separately in the Photo section. Add descriptions and photos to the remainder of the live show videos.